That's all for now folks after a day which saw leaders Coleraine and second-placed Glenavon chalk up victories. But perhaps the biggest result of the day came at Ferney Park with a first three-pointer of the season for the Mallards. Glentoran have moved up two places after overcoming the Swifts in our evening kick-off. Thanks for joining us and we'll be back next Saturday with more drama from the Irish Premiership. Two early strikes earn the Glens a win which takes them fourth and trailing old rivals Linfield on goal difference. Dungannon huffed and puffed but they lacked a curring edge and they remain seventh. Time is running out for Dungannon to mount a comeback - just 15 minutes left and they have struggled to carve out openings in the second half. Glentoran squander another golden chance to stretch their lead - Curtis Allen sends Robbie McDaid clear on goal but keeper Stuart Addis rushes out and blocks the low shot. Swifts midfielder Ryan Mayse fired over early in the second half and we now have rain sweeping down on Stangmore Park. Curtis Allen fluffs a good chance for the visitors - he's clear on goal after a neat one-two but the striker fails to get enough meat on his shot and it's a simple save for Stuart Addis. Most of the action is now at the other end as Dungannon force corner after corner without capitalising. The hosts have finally settled into the game as we reach the midway point of the first half. Dungannon have won a couple of corners and it's become a more even affair after Glentoran's blistering start. The visitors double their lead in scrappy fashion with Calum Birney bundling the ball in at the backpost from a free-kick. Dungannon fail to clear and the ball bobbles about before Birney nets from close range. The hosts look a bit shell-shocked after a whirlwind start from Gary Haveron's men. The perfect start for the Glens as Curtis Allen heads in an early opener. The striker nips in front of his marker to nod home from a cross after just three minutes. The visitors can join third-placed Linfield on 21 points if they pick up a victory at Stangmore Park. We played well and we're delighted with the win (the first in the league this season). It was a super performance and we've finally got that monkey off our back. It was challenging time but we kept believing and we got a great response from the players today. It's important to win games against teams around us in the table so it's big to beat Carrick. It keeps us going and hopefully we can push on from this. We're really frustrated. I think we've worked really hard in recent weeks to get the basics right but I don't think we got them right today. They've taken their opportunities but we got caught into playing a style of game that doesn't suit us. They had something to hang on to and we gave them that. I thought we battled well at times but went missing at other times and I'm disappointed with that. It's a missed opportunity for us to get another three points, but we're still a work in progress and today is nothing to panic about. We played really well in the first half and deserved our half-time lead. The second half was more difficult and we missed a chance to make it five - if that had of gone in I think we could have added to the score. But credit to Ballymena, they stuck at it but we have come away with the three points. We're in second place, we've got a good mix of youth and experience and there's no reason why we can't push on from here. It's been a tough week physically and the intensity of the game was tough on us today coming off the back of the Crusaders game on Tuesday. The first goal was a great strike and I think the second was McCready's first goal of the club which gave us an important victory. There's no secret - we just keep training and playing and it's working for us. I thought we looked fatigued today but sometimes it's not always about free-flowing football and the result matters more than the performance. Glentoran manager Gary Haveron says his side "are exactly where I expected us to be" after the first round of 11 fixtures in the Irish Premiership. 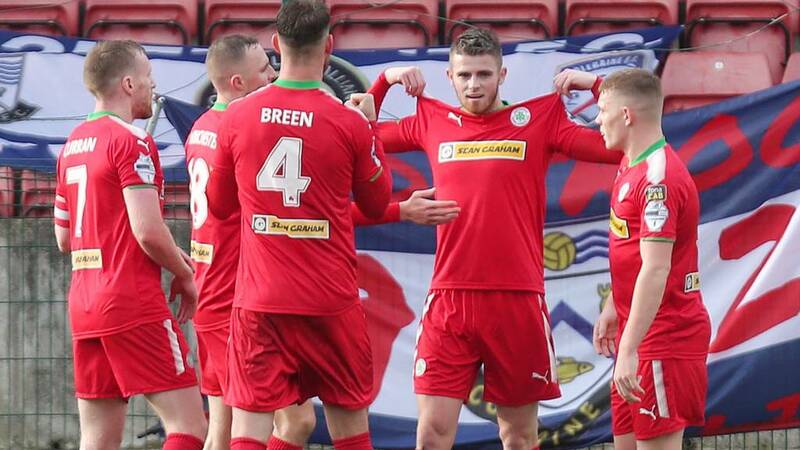 The Glens have lost at home to north Belfast sides Crusaders and Cliftonville in recent weeks, with a victory over Ards sandwiched in between. The Reds have a massive penalty shout waved away right at the death but it's full-time and Coleraine's run continues. Cracking game.